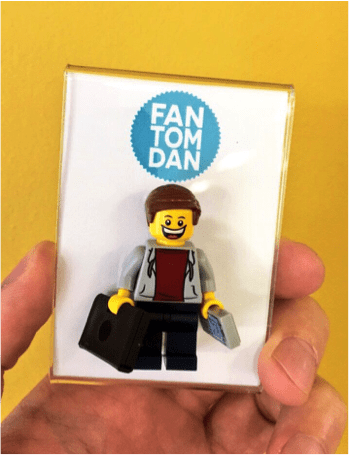 I was given the opportunity to try out Mini-Me – a company based in Cape Town (South Africa) that specialises in customised Lego minifigures. I received my very own miniature version of myself recently and love it! Here are my thoughts. Mini-Me has an impressive inventory of original Lego minifigure parts to create whatever you want. Make a Lego version of yourself, a friend, partner, boss, your favourite superhero or go completely off-script and create an entirely random character. It’s all up to you. But that’s only half the fun as there are a variety of options for you to display your minifigure on. All of this comes together to make a truly personal and special gift. The Novelty – I really love this concept! Whether it’s for yourself or someone else, the fact that you select each piece for your character to your exact liking is part of the fun. I loved creating a mini version of myself by picking out each item based on how I really look. Similarly, making a Lego version of someone else would be just as entertaining. Beyond that, Lego was a memorable part of many people’s childhood, so you can’t help but feel a sense of nostalgia when browsing the website. But aside from that, actually having the final product is just totally cool. Whoever thought they’d have a Lego version of themselves? I certainly didn’t. The Selection – There are tonnes of pieces to choose from on the Mini-Me website. Whether it’s yourself or someone who’s just graduated, gotten married, been promoted, etc., you’re certain to find any Lego piece you can imagine to make truly unique minifigures. It’s not all about recreating real people, though. Mini-Me also stocks parts for you to build your favourite movie or TV character. In addition to having parts for ‘Lego people’, they also sell numerous accessories and animals to compliment your character. As if that’s not enough, there are a range of stand options for you to display your Lego minifigure on. My favourite ones are the plexiglass stands that you can personalise to add that extra personal touch. The Convenience – Despite the volume of parts on their site, the website is easy to use. Pieces are categorised clearly and arranged by colour on each catalogue page. Mini-Me then delivers your minifigure straight to your door within a matter of days for a standard nationwide rate of R60 and R85-R105 for international orders. And, if you don’t care for building it yourself as a gift to someone else, vouchers are also available for purchase. The only factor that might make some people think twice is the cost. Each piece of Lego is priced differently, but generally averages at about R45. So, if you create a standard figure, you’re looking at spending around R185. That’s excluding a stand, accessories and the cost of delivery. However, because of the uniqueness of these minifigures, particularly as a gift or to remember a special occasion, I’d argue that it’s worth it. It’s also important to bear in mind that the availability of certain Lego pieces is a major factor in how items are priced. For more information on these details, you can visit their FAQ page. I absolutely love the concept of Mini-Me. Not only do I find it particularly cool that you can make a Lego version of yourself, but as a gift, this is a fantastic idea. The options for what characters you can make are endless so I urge you to visit their website where they have several inspiring ideas you can use, or start from scratch with your own unique creation. The posts they share on social media are also fun and edgy so check them out – links below. Thank you, Mini-Me, for my Mini-Me – I really love it.